Welcome to The Fintech Briefing, a morning email providing the latest news, data, and insight into disruptive fintech in the UK and Ireland, the Continent, and beyond, produced by BI Intelligence. Want to receive The Fintech Briefing to your inbox? Enter your email in the box below. MONDO CO-FOUNDER ON THE FUTURE OF DIGITAL-ONLY BANKS. Several digital-only banks are due to launch in the UK this year, including the high profile Atom, Starling, and Mondo banks. Mondo is the only one of these that currently has a live product, having launched its second phase of testing last week. Anyone with an iPhone can now download its app, which offers spending tracking and P2P payments between Mondo customers, and join the waiting list of around 50,000 people to receive a prepaid card. Mondo will add more functionality once it gets its banking licence from the UK regulator. We attended an event last week where Mondo co-founder Tom Blomfield talked about his vision for the future of banking. British consumers still want "banks." There is a psychological reason Mondo defines itself as a bank, despite its efforts to distance itself from incumbents, according to Blomfield. He believes that the British public are trained to believe they must have a bank account from a young age — so even though a product may provide the same or better services, it won't get traction unless it's called a bank. But the future of banks is as "digital identity brokers." This means your bank account will be connected to all the other services you use, like investments, and contain all the data that identifies you as you. In the future, instead of using your Facebook credentials to log into 3rd party services, you could use your bank account details. APIs will "upend retail banking in the UK". Open APIs, which UK banks will soon be required to build under EU law, provide third-parties with services previously reserved for banks. Third-parties can use these services to provide better financial products for consumers, without the constraints that hold back banks like regulation and old IT. For example, in the future, comparison sites could autopopulate a consumer's financial details to provide them with the best deal on financial products. Or, a new direct payments system which bypasses Visa and MasterCard, like iDEAL in the Netherlands, could be created and pass cost savings onto consumers. The definition of a bank is going to change. Fintechs are better at providing the consumer-centric financial products people are coming to expect. This is partly due to a combination of new technology making fintechs agile, without legacy IT systems holding them back, and iterative design processes allowing fast integration of consumer feedback. The result is a change in consumer expectations of all financial services providers, and what they expect a "bank" to be. WECHAT PAYMENTS SOAR. The volume of payments handled by Chinese tech companies continues to grow. WeChat, the messaging service owned by Chinese internet giant Tencent, could handle more than £380 billion ($550 billion) this year, according to calculations from Reuters. This figure only includes money sent via WeChat's P2P payment service, and not the other payment types it facilitates such as taxis, online media and restaurant bills. That means the total figure will likely be much higher. Tenpay still behind Alipay. Tenpay, the payment platform underlying WeChat, had a fifth of the third-party mobile payments market in China in Q3 2015, according to iResearch.Alibaba-affiliated Alipay accounted for nearly half. Dwarfing PayPal's 2015 volume. If WeChat processes the volume forecast, then it would be double the total amount US payments leader PayPal processed globally last year — £195 billion ($282 billion). This figure includes online, mobile and P2P payments. The third-party mobile payments market in China is vast. It reached £260 billion ($376 billion) in Q3 2015 alone. It's driven by a large population of nearly 1.4 billion, with smartphone penetration of about 50%. It also lacks a legacy digital payments infrastructure to overcome. The big figures published by WeChat and Alipay have encouraged firms like Apple to enter the market. However, the two giants have such a stranglehold on the market that it will be difficult for Apple to gain share. SWISS REGULATOR PUSHES FOR FINTECH GROWTH. Swiss Financial Market Supervisory Authority (Finma) has created a number of new rules to help fintech startups thrive, according to Finextra. One big change is that it will now be easier for fintechs to authenticate their customers online and through video. The rules also make licensing less burdensome for innovative companies and some firms will be license-exempt while they are testing out products. Finma's reasoning for easing licensing requirements is that startups often have more focused business models than legacy banks which merits reduced regulatory scope. Startups that accept £36 million (CHF 50 million) in deposits or less can apply for a financial innovators' license. Firms must hold £214,114 (CHF 300,000) and 5% of deposits as collateral. The Swiss financial industry is facing pressure to evolve as foreign governments crack down on tax havens. Switzerland joins the UK and South Korea on the growing list of countries that are loosening regulations to stimulate the burgeoning fintech industry. Fund Transfers & Payments, rated most likely to be disrupted by 59% of respondents. Small & Medium Enterprise (SME) banking, rated most likely to be disrupted by 39% of respondents. Nearly 90% of surveyed executives believe they will lose business to fintechs. Execs fear that the disruption will lead to a decline in market share, margin pressure, and a loss of customers. 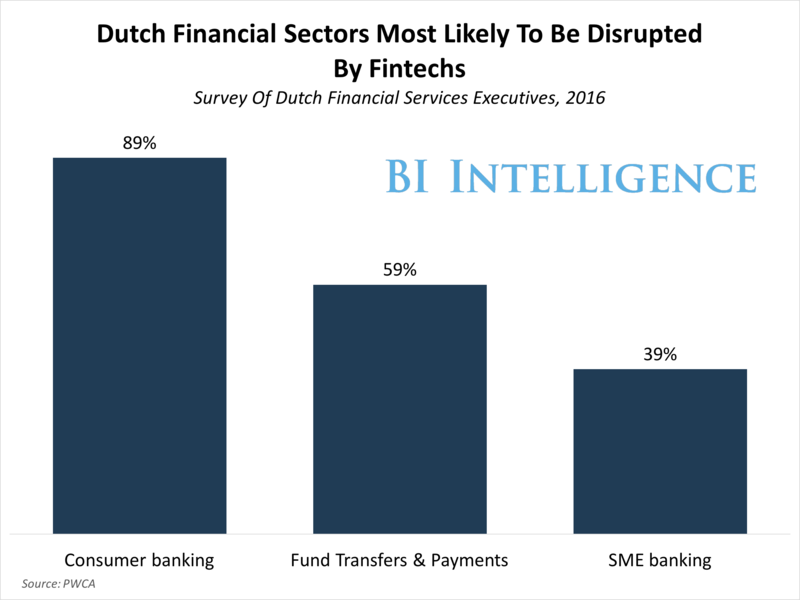 But they are collaborating with fintechs — only 3% said they were not engaged with fintechs in some way. This fits the emerging global pattern of co-operation between fintechs and incumbents as banks try to avoid disruption. Enjoying The Fintech Briefing? Enter your email to receive it directly to your inbox. SQUARE FACING TROUBLES DOWN UNDER. Square brought its mobile card reader into the Australian market earlier in March, but is facing security concerns from the country's largest bank, Commonwealth Bank of Australia (CBA), according to Finextra. At the behest of Visa and other card schemes, CBA has temporarily unblocked payments facilitated through the device. However, if the bank's security concerns aren't resolved, the bank will again block transactions. CBA offers a competing mPOS product called Albert which may impact its decision on whether or not to block Square. Another difficulty for Square is that it has not launched its contactless-capable card reader in Australia — 60% of card payments in the country are contactless, according to the Economic Times citing ANZ Bank. That could frustrate consumers who are used to making contactless payments. P2P LENDER CLOSES £5.5 MILLION ROUND IN LATIN AMERICA. World Bank Group and Elevar Equity each contributed half of Afluenta's Series B round. In 2012, Afluenta launched in Argentina and has since expanded to Peru with planned expansion to Mexico, Colombia, and Brazil in the next year. Latin America hasn't seen the same explosive fintech growth as Asia, Europe, and the US, but there are some positive signs. P2P lender Lendico launched in Brazil in 2015 and Dutch P2P lender Lendahand is active in Colombia, for example. FEMALE-FOCUSED ROBO-ADVISOR TO LAUNCH IN US. DailyWorth, a financial and career advice website is in the process of launching an advisory platform targeted at affluent women that will automatically create investment advice, according to Wealthmanagement.com. In order to receive advice, users will answer a number of survey questions about their personality and what they would like to achieve. The female-focus is built into the design of the platform, according to co-founder Michelle Smith — but pre-launch, the details of what that means are unclear. DailyWorth's newsletter has 1.2 million engaged users which provides a sizable prospect pool for when WorthFM launches.